Over the years, economic considerations have overtaken the sustainability issue. Low and erratic rainfall, frequent droughts, the increasing costs of cultivation, lower compensation of labour and inputs have made farming in the arid regions a challenging enterprise. Employment opportunities in sectors other than agriculture have enticed many to cross the floor. The largest segment of the farming community, however, is constrained to make a living from farm related activities. With the opening of markets for international trade in farm commodities, the competition has toughened for the resource-constrained farmers of the arid regions of the country. On the other hand, useful technologies have been generated by researchers on many alternative systems, which could be adopted. In this scenario, the farmers could benefit greatly by inducing diversification in the farming systems and by strengthening the traditional systems. With this backdrop, a National Symposium on Livelihood Security and Diversified Farming Systems in Arid Region was organized by the Arid Zone Research Association of India at the Central Arid Zone Research Institute, Jodhpur, from January 14-16, 2006. 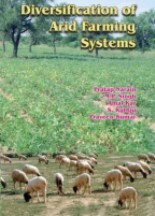 Selected papers presented at the symposium and invited articles have been included in this compendium and are grouped in sections on Diversification, Strengthening the Traditional Farming Systems, Enhancing Resource Use Efficiency, Livestock-based Farming Systems, Value Addition, Socio-economic Issues and Transfer of Technology. Currently, food, water and energy crises are of global concern. The challenge ahead is to strike a balance between basic needs of a large population and to maintain the pace of development. Diversification of farming systems may contribute towards achieving this goal to some extent. It is hoped that the book will provide options for diversification of the existing farming systems and benefit there from.